How can Tiger Woods win the Masters? He has to master greens. Tiger Woods is trying for his fifth green jacket, 22 years after he won his first. 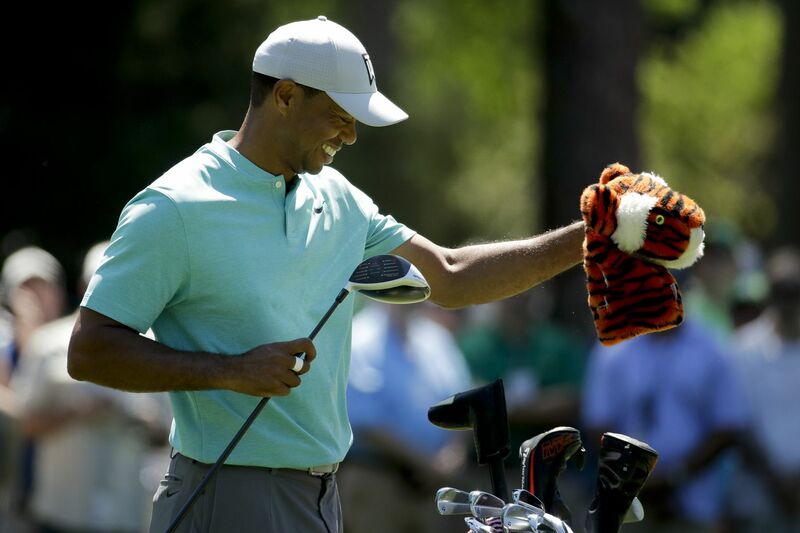 AUGUSTA, Ga. -- What we know about Tiger Woods as the Masters approaches Thursday differs from what we knew a year ago, when his back was still balky, or certainly from the two years before that, when he wasn’t even well enough to put his tee in the turf at Augusta National Golf Club. We know this: He has all the shots to win here and, just as importantly, the renewed belief that he can. “I’ve proven that I can do it,” Woods, who tees off at 11:04 a.m. on Thursday, said. That’s true not because of his history here, his green jacket-winning history that -- if you can believe it -- is now 14 years behind him. It’s because, even after long stretches where his challenges weren’t getting through Amen Corner but rather getting out of bed, he won the Tour Championship last fall, his first victory of any kind in five years. On top of that, he contended at the British Open (tied for sixth) and the PGA Championship (final-round 64 to put pressure on eventual champ Brooks Koepka). So the parameters are clear: Woods can win this week. "I just think that greatness is still in him," said none other than Phil Mickelson, his one-time rival who now joins him in trying to find success when the prime is past but the end doesn't quite seem in sight. But here's the thing: For Woods to take what would be his fifth green jacket a full 22 years after his first, he doesn't have to be the exact player he was back then, as flexible as Gumby and miles longer off the tee than the rest of the field. That player is never returning, and that's fine. What he has to do, though, is putt like that player. Seems simple. Might be impossible. "I feel like I can still putt," Woods said. Tiger Woods (left) works on putting during a practice round on Wednesday. The physical act of stroking the ball, sure, he can do that. But think about the scenes that define Woods' career. Yes, there's the chip-in from behind the 16th green in 2005 here, the ball that used its last revolution to sneak into the cup and, eventually, beat Chris DiMarco. But beyond that, it's Tiger pointing at the ball and chasing it in at the 1999 PGA. It's Tiger on the 72nd hole at Torrey Pines, a dozen feet to force a playoff with Rocco Mediate for the 2008 U.S. Open. When that putt rolled in, Dan Hicks, calling the tournament on NBC, all but screamed, "Expect anything different?!" Back then, you didn't. The putt could be for birdie. The putt could be for bogey. Tiger was going to make it, always. Now, though? Even as Woods brings with him this week the confidence he can win, it's separate from the confidence he once had in himself - heck, that all of America had in him - over an individual putt. You need go back only to Woods' most recent competitive appearance, at last month's Match Play. There, Woods hit a brilliant bunker shot on the 18th hole in his quarterfinal match with someone named Lucas Bjerregaard. He had four feet for par to extend the match. It used to be a layup. This one lipped out. There is a theory on putting that, over time, the misses are easier to remember than the makes. The mind becomes something of a haunted house, with ghosts of putts gone bad lurking around every corner. Experience is a friend at Augusta National. But naivete is a friend to putting. An example: Nearly a decade ago, the great Tom Watson played a British Open round with Ryo Ishikawa, then an 18-year-old budding star who putted with the authority of an 18-year-old budding star - who didn't know better. "He reminds me of me when I was his age," Watson said then. "Straight back, straight through and every putt solid. How do you do that? I've forgotten." So it's not whether he can reach the par 5s. It's whether he can make the five-footers. And there remains the question: Can a formerly great putter become a currently great putter? "One hundred percent," said Mickelson, at 48 five years Woods' senior. Mickelson is biased in this regard, but he comes equipped with evidence. Five years ago, his putting stroke was broken. With the help of short-game aficionado Dave Pelz, he rebuilt it. "The last two or three years, I've been top 10 in just about every [putting] stat," Mickelson said, "by working on it and figuring some stuff out and spending the time on it." That explanation is important as it pertains to Woods. Mickelson believes he fixed himself by not only deciphering what was wrong, but by putting in the work to correct it. Woods' four back surgeries are behind him, but they linger in an important way: He can no longer work through problems. Woods is now 43, with far more chances to contend here behind him than ahead. So we're at a strange spot. He has those four Masters titles: 1997, 2001, 2002 and 2005. That's as many as the late Arnold Palmer; only Jack Nicklaus has more. Yet Woods last won the Masters at 29. He last won a major at 32. To not win another - of either - for the following decade? "I wouldn't have foreseen that, for sure," Woods said. The brittle body provides the basis for it being fair to say Woods has just four Masters, has just 14 majors. Not long ago, the annual question at this time of year would be whether he could reach Nicklaus' record of 18. Seems preposterous now, right? "I've seen him do things with a golf ball and perform at a level higher than anything I've seen in the game," Mickelson said. "I just would never rule him out." That’s probably smart. His back is better. His belief is back. Both matter. But if Tiger Woods can’t stand over a 10-footer and know it’s going in - be it for birdie or bogey, be it Thursday or Sunday - well, then, someone else will be slipping on the green jacket, and he’ll be another year away from the last time he did the same.